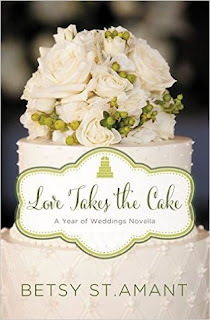 Charlotte Cantrell is always the baker; never the bride. Clients come from near and far for her renowned wedding cakes. And while the wedding scene is Charlotte’s place to shine, her own love life is more dull than ever. When Will, a regular at Charlotte’s bakery, catches her attention, she can only hope that he is the reliable man this single mother has always hoped to find. The problem is that he’s regularly stopping in to buy cookies for another girl. But when Charlotte is hired to bake a host of wedding goodies for a difficult bride and finds out Will is the best man, she has the perfect opportunity to get to know him better—and find out how serious Will is about this other girl in his life. Charlotte's secret crush on her handsome customer is completely natural, but when he asks her out, she automatically assumes he is a cheater like the man who left her single and pregnant. Will is confused since he thought the attraction was mutual, but because he is ashamed of his past, he has a hard time pursuing her. There is quite a bit of inner turmoil and angst in both characters, which overshadows their brief connection. I felt like things didn't have much chance to develop before the ensuing drama hit. Overall it was an interesting story of second chances and seizing the day. Former pageant queen Stella Varland doesn't trust beauty anymore after her divorce. Her appearance betrayed her and led to her brokenness so instead of being beautiful, now she tries to make beautiful things, but always falls short. So she keeps her passion for her secret art to herself and focuses on her interior design work. But if she doesn't get another job soon, she ll be stuck living with her parents. Contractor Chase Taylor is determined to live a life of no regrets after losing his fiancee in a car crash. Now he lives life at full speed, striving to see how much he can accomplish. He knows if he slows down, he ll fall apart. So he returns home to Bayou Bend to renovate the town s old theater, and is shocked to learn former flame Stella is the designer for the project. Forced to work together, Chase and Stella battle their chemistry and their pasts as they struggle to compromise and come together on a vision for the theater. Chase doesn't understand why Stella is such a subdued version of herself, while Stella doesn't get Chase's constant need for productivity and speed. Their wills clash as they attempt to hide their brokenness and their unresolved feelings for each other until Chase breaks through Stella's walls and convinces her to enter her mosaic tile art in a contest. A near catastrophe, a fire, and a small-town gossip mill finally force both Stella and Chase to realize that they have a choice to hold on to the shards of their pasts, or surrender their fragmented pieces to the One who makes a beautiful masterpiece from the broken. I had mixed feelings about this book. It's definitely well-written, but it was hard for me to relate to and feel the chemistry between the main characters. In the beginning the history between Stella and Chase was alluded to as scandalous, but details were not shared which kept me guessing... and then later in the book it was only ever referred to vaguely, leaving me unsatisfied. Stella is recovering from anxiety and still experiencing some symptoms which she attributes to her dysfunctional marriage and divorce, but again, the details of her history are vague and it made it more difficult for me to fully connect with her. Perhaps it would have slowed the pacing down to include too much, but for me it was not enough. My favorite thing about the book is Stella's secret talent as an artist and how she relates her emotions to this outlet. When she isn't a falling apart mess she and Chase do have some fun banter and friendship, but both allow the past and the animosity of Stella's family to prevent a romance from developing again. The project of renovating the movie theater was a great setting- it provided a unique backdrop and challenges for the characters to deal with. I loved the insights of Dixie, a local homeless woman in tune with some spiritual realm, who shares little nuggets of wisdom with Stella. Giveaway Hop! 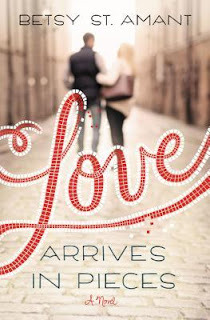 All's Fair in Love and Cupcakes and 150+ other giveaways to check out! 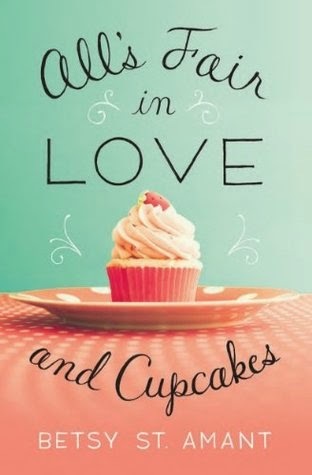 All's Fair in Love and Cupcakes by Betsy St. Amant! There are over 150 other book giveaways to check out! Happy hopping! She's written a recipe for her future, but does it include love? Katherine 'Kat' Varland is a small town girl, born and raised- and every day, her dreams of owning her own bakery get further away. She has no money, and the cupcake shop she bakes for, Sweetie Pies, seems to get smaller and smaller. Kat might be the sweetheart of Bayou Bend, Louisiana, but she longs to make a name for herself where she can flourish as Kat- not as the girl baking someone else's recipes. As head coach for the Bayou Bend championship high school football team, Lucas Brannen is used to winning- everything except his best friend's heart. He finally gathers the courage to make a gesture and show Kat his feelings by signing her up for the popular reality TV show Cupcake Combat. But his plan backfires after he realizes the cash prize for the winner also includes a one-year baking contract at one of New York City's most famous pastry houses. The situation grows sticky when Kat enlists Lucas's help as her baking assistant for the show. Lucas is torn between helping Kat live her dream and selfishly wanting to keep her in town. His plan has always been a dozen acres of land and a farmhouse in Bayou Bend- but Kat is blinded by the stars in her eyes. Will Lucas and Kat risk their chance at love in order to achieve their individual dreams? Or will they find that sometimes the most delicious happily-ever-afters begin and end in the same place? I love stories where best friends fall in love! It's fascinating to see how a relationship makes the shift from friends to more-than-friends. There is plenty of angst from both of the main characters as neither realize that the other feels ready to move forward... which sometimes became repetitive when they would continue to hold each other at arms length and fail to communicate. I don't enjoy watching reality shows, but that aspect of the plot was well-written and kept things exciting. The personalities of Kat and Lucas were both likeable so it was fun to follow their drama and see how things would end up. 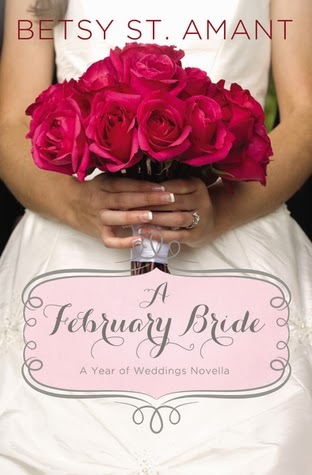 In A February Bride by Betsy St. Amant, history repeats itself when this bride runs out of the church on her wedding day---in the same dress that had been passed down for generations and worn by her mom, grandma and great-grandmother who also ran out of their weddings. The heroine struggles to break destructive cycles of the past. Can this bride shuck expectation and discover who SHE is as a bride and in the Bride of Christ? And if she finally walks down the aisle, what dress will she be wearing? I loved the sweet characters in this book; they seem like people I would be friends with. I didn't think the bride's reason for ditching the man she was still in love with was delved into deeply enough. Her fear seemed superficial and irrational, making me feel that the storyline was not completely believable. I also had a hard time believing the groom had never contacted her or asked her why, even though she was "the love of his life." I did enjoy the interactions of the main characters once they were talking again... and the ending was pretty fun.